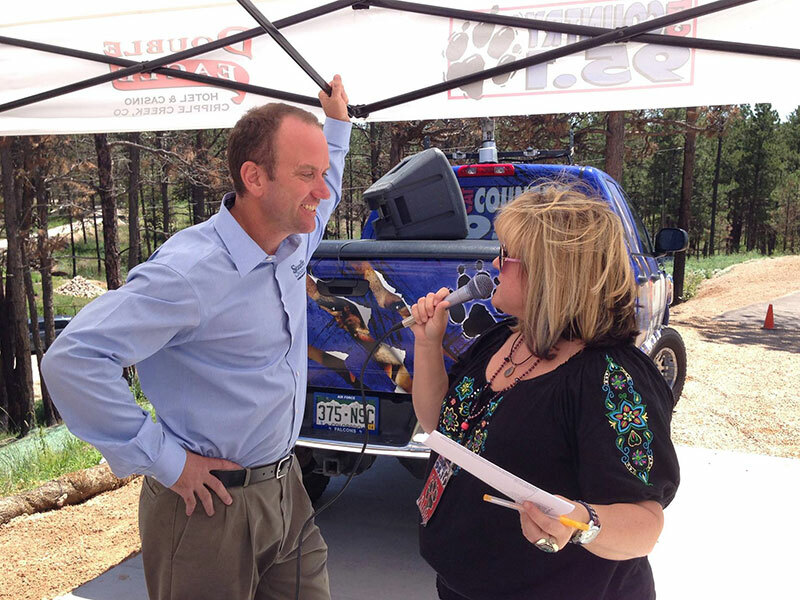 We had a radio remote at our Parade of Homes location last week! It was fun to meet Alisha from CAT Country 95.1’s morning show, and we had some games and prizes for people who showed up. If you’re a regular listener of CAT Country 95.1, you may have heard Andy being interviewed. Thanks to Alisha for coming out to see us! Alisha: Hey, it’s Alisha from the Cat Country Morning Show—Parade of Homes. Man, it’s a gorgeous day to be out checking out all the great homes. Andy Stauffer is here and you guys have been in business for a long time. Is this your only home? Andy: We’ve been in business 15 years now at Stauffer & Sons Construction and, yes, this is our only parade home. Wouldn’t want to do more. There’s a lot to it, yeah. Alisha: [laughs] But this is a cool house because this is a rebuild from the Black Forest fire. Andy: We have renovated their home twice in the last five years, both of which, both renovations, went up in smoke last year in the Black Forest fire. So it was tough for them. So they’re thrilled to now have an opportunity to build a brand new home. Last time we’ll do it, now. No more fires. Alisha: Ha! I agree with that. Tell us a little bit about this home because it is absolutely gorgeous. Andy: Thank you very much. Yeah, this home is about 3,000 square foot finished, another 1,000 unfinished. We have a geothermal system here. We have, you know, beautiful stucco and stone exterior capturing peak views, concrete floors, granite counter tops and beautiful La Cantina doors that just open up to the back patio. It’s a beautiful home and it was a fun collaborative effort with the homeowners, designing and building it. Alisha: Would it be weird if I just hang out and stay here until they come home? Andy: You are more than welcome to. Andy: They actually decided they’re going to disappear for about a week or so but, yeah, there’s a bedroom upstairs. We’ll put you in the guest room. Alisha: Outstanding! Come see us. We’ll be here until 3:00 today, right off Shoup Road. We’ll be here until 3:00 with Cat Country 95.1. It’s the Parade of Homes. Alisha: Hey, it’s Alisha from the Cat Country Morning Show. It’s the HBA Parade of Homes. We’re at 12720 Peregrine Way, just right off of Shoup. All you’ve got to do is just follow the signs. Stauffer & Sons, a custom home builder, is the home builder that built this one and this house is absolutely amazing. I’m with Andy Stauffer and this is a rebuild from the Black Forest Fire, but there’s some pretty cool features on this house. Andy: Yeah Alisha, you were asking about the geothermal system, and most people are asking, “Hey, how does that work?” And so the short answer is ‘It’s magic!’ …but the truth is people want to know a little more, so on Monday at 3:00 here at the house we’re going to do a seminar on the geothermal system. And so basically we’re just pulling energy out of the ground. We’re using it to heat the house, we’re also using it to cool the house. So it’s kind of a little paradoxical. We’re taking that heat energy and we’re using it to cool the house. So if you want to come in at 3:00 on Monday and learn how that works, we’d be happy to explain it to you. Alisha: That’s awesome, and you can take a walk around the house, too. I mean, you had me at pizza, Andy. There’s a fireplace pizza oven, what!? Andy: You know, yeah, we’ve got a wood burning stove here. We’ve got plenty of wood to burn quite frankly, from the fire with all the downed trees. And so we figured, what the heck, let’s get a wood burning stove with a pizza oven attachment to it. So we’re looking forward to the very first wood oven-fired pizza. Alisha: You’re my new hero. Alisha: [laughs] Come up, check it out. It’s the HBA Parade of Homes, like I said, 12720 Peregrine Way, just off of Shoup Road. Just follow the signs, look for the cars parked out front. Come by and see us. We’re going to be here until 3:00. We’ve got lots of Cat Country prizes, too. We’d love to see ya! Parade of Homes with Cat Country 95.1. Alisha: Hey, it’s Alisha from the Cat Country Morning Show. The 60th Annual HBA Parade of Homes is under way, and we are at an absolutely gorgeous home. We are at 12720 Peregrine Way just off of Shoup Road, you can follow the signs. And Stauffer & Sons built this home. It’s a custom build. You guys build these homes, and this is the third time you’ve worked with this family. And I just went through this home. It is amazing. I mean, I can’t even think of another word. It’s absolutely gorgeous. The patio is fantastic. Tell me a little bit about what makes this house different. Andy: You know what, I think we’ve gotten some of the most positive response over that back patio, just like you were saying, and for a couple different reasons. We have a 12 foot La Cantina accordion door that opens up entirely, opens the back patio up to the great room. And so you can spill out onto a covered patio, and then it’s funny, the way the patio works out with the backdrop it’s like our own version of an infinity pool. When you stand there you look out and you see the bushes and the trees in the distance. And so it’s kind of like resort living. You know, I think these homeowners are going to pinch themselves and wonder when they have to leave this Bed and Breakfast. You know, but they actually live here so they get to enjoy that, yeah. Alisha: And that’s cool. It’s kind of sad; you look around and you still see some blackened trees, but this is a beautiful house that has emerged after the Black Forest fire. You guys did a remarkable job. Andy: Well the new home and the view of the peak and getting to do what they want, that’s the silver lining to a very difficult situation. Alisha: Awesome. Come out and see it. Stauffer & Sons built this house. It’s on the HBA Parade of Homes, like I said, 12720 Peregrine Way just off of Shoup Road. Follow the signs. It’s super easy to find it. I mean, if I can find it, you can find it. And don’t be surprised if you find me sitting on the patio or lounging in the kitchen or… I saw a big bathtub in there. I’m just saying, no judgment. Come see us. We’re here until 3:00, Parade of Homes, with Cat Country 95.1. Alisha: Hey, it’s Alisha from the Cat Country Morning Show, the 60th Annual HBA Parade of Homes going on, and we are at a gorgeous house built by Stauffer & Sons, a custom home builder, 12720 Peregrine Way just off of Shoup Road. Follow the signs. You’ve got to see it. And Andy Stauffer is here, and the house is absolutely gorgeous. It’s a rebuild from The Black Forest fire and if someone’s coming to this house, what is a must see—like what are you most proud of in this house? Andy: A lot of the folks, when they walk in, they see the breakfast booth there, and they say, “Wow, that’s a beautiful table” and then they look in a little closer and they say, “Wow, that is ponderosa pine reclaimed from the fire.” And for the homeowners it’s kind of bittersweet to have such a beautiful table that has something from the past, the trees that used to stand right here on this property. So we downed those trees after they had died in the fire. We milled them up. We built a beautiful table out of it, and then that’ll carry forward as they raise their family and they have their meals at that table. Alisha: It’s absolutely gorgeous and the staircase on this one, too, is gorgeous as well. Andy: As soon as you come in, you’re greeted with just a beautiful grand, heavy timber staircase. And so that grabs people as soon as they come in. So we’re very proud of that. Alisha: It’s a custom home. It’s absolutely gorgeous. You’ve got to see it. You know all about the Parade of Homes. They’ve been around for 60 years. And these are homes that you can get decorating ideas from, or if you’re thinking of building a house, you know what, you can get some building ideas. So come by and check it out. We’re going to be here until 3:00. 12720 Peregrine Way with Stauffer & Sons, a custom home builder, and the Parade of Homes with Cat Country 95.1.